This is part II of my trip to Zanzibar. Check out part I here. Bright and early I met up with the group of 20 other snorkelers and divers at the pick up point for our guided trip on a dhow. The hyper crew had us all introduce ourselves by name and origin. The group of six from my hotel were aboard, along with two white South African girls. The rest of the group hailed from places in Europe like Germany, the Netherlands, England, Scotland and Poland. I was the lone person who lived in America. I was also one of only two solo-ers and the only black person aside from the crew. Thankfully, no one directed a shocked exclamation of, “YOU ARE BY YOURSELF? !” my way. The coral were “reach out and touch someone” large. I could swear one tried to grab my leg. Our guide made sure we all stayed together so no one got lost or taken by coral or lost in the frigid, choppy water. The problem with guided snorkeling is everyone must enter and exit the water together. If you decide you want to stop – say if you’re chilled to the bone and wish you’d accepted a wetsuit when offered – you have to tell the guide and then everyone must return. Even though I felt like my legs were going to fall off and it’d be 127 Hours: Indian Ocean edition, I opted to grin and bear it. I wasn’t going to ruin the trip for everyone else. My eyes were closed, so I pretended I didn’t hear him. “Ah, America. I like to visit there one day. Where is your simba?” Hmm, simba means lion, so is he talking about a man? “How old are you?” I told him. After three weeks in TZ, I’d heard the beloved 80’s Kenyan pop hit so many times I could play it myself. He asked me to join him in playing. I could see the South African girls peeping over curiously. His tenacity and earnestness was admirable (and amusing). Tempting. He wasn’t bad to look at: Wesley Snipes choco with short dreads and very fit from his day job. “The people do not start dancing until 11.” I shook my head no. “Dada, why do you reject me? What is wrong with me? I am going to sing another song. It is about a man with a broken heart.” He launched into a sad melody and looked at me forlornly as he sang. Is this really happening? I fought the urge to laugh. Everyone on the top deck eavesdropped without subtlety. Dejected and rejected, he left to attend to his captainly duties. We neared the shore where high tide had rolled in, bathing the beach in ocean water. The captain and his assistants navigated the dhow 100-feet from shore and anchored it. “Ok, ladies and gentleman, you will have to swim. We will pack your things.” Is he for real? I can’t swim that! I can swim in a calm, contained swimming pool next to toddlers diving and synchronized swimming. Not a angry-waved, freezing ocean. Embarrassingly I had to ask for help. Of course, who else but the broken-hearted captain also doubled as lifeguard? Now I felt like I owed him. But, not enough to reconsider going dancing. Once we hit dry land, I thanked him profusely and said goodbye. He threw a last sad-puppy face my way. Later that afternoon, I headed to the bar at the hotel to have a pre-dinner drink and enjoy the ocean view. I introduced myself to the bartender, Bakar, who’d met my friend J earlier in the week. “So, you are friends with J_, yeah? He is my best friend!” This tickled me. People seemed to get attached quickly in TZ. “Really?” he asked, surprised. “But, in America, you have a job. You can pay for yourself. Here? The woman wants you to buy her things that are simple, like bras. And they ask you to help their family too.” I could see his point. I dined solo at dinner that night and continued reading my book. I ordered fish for dinner mostly so I could share it with Mwezi, the hotel kitty. I went to bed early in preparation for the next day’s activities. 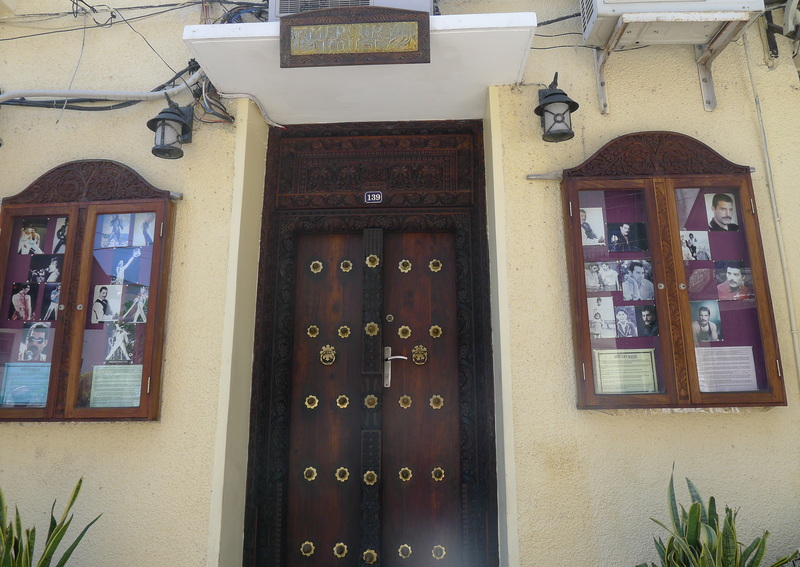 The hotel manager had helpfully arranged a spice tour and Stone Town excursion for me. In the morning, a driver picked me up and me to a local farm where a guide awaited me. I thought I’d be joining a group to tour the farm, but I had my very own guide! 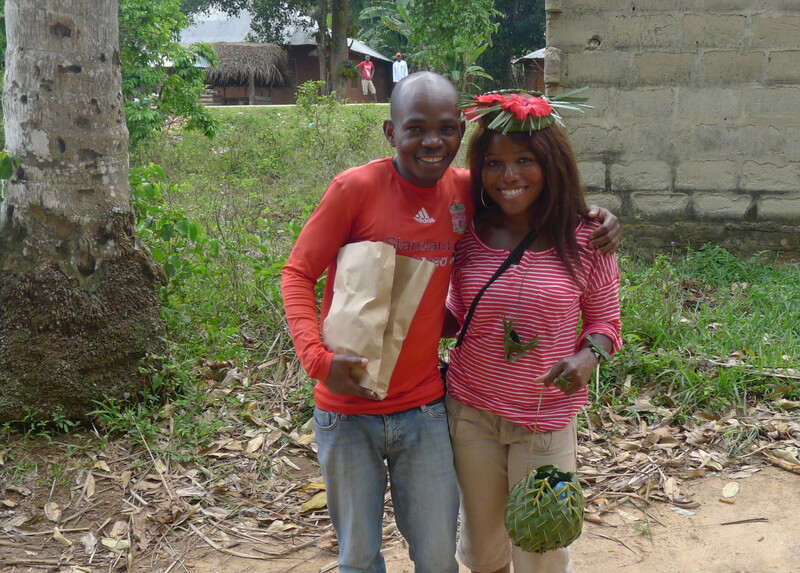 I loved my guide; he was very knowledgeable and sweet. 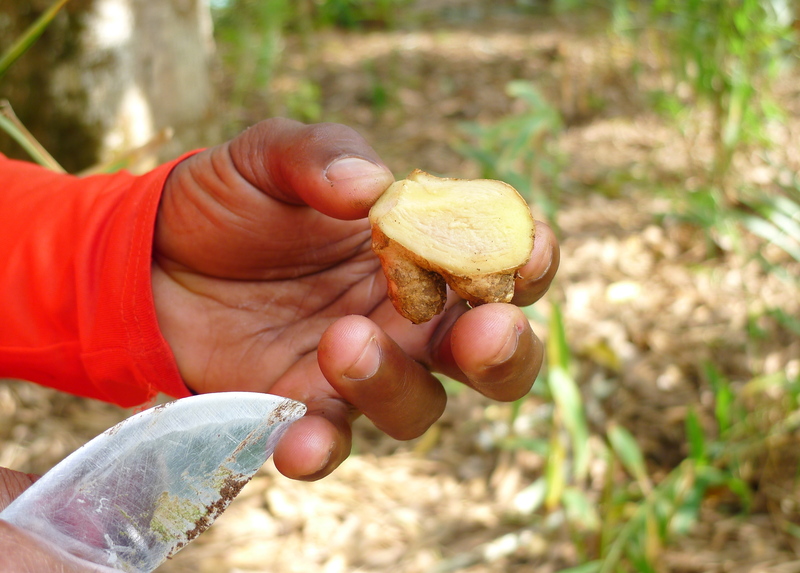 Ginger is used as a male aphrodisiac in addition to its use in flavoring foods and aiding in wellness. 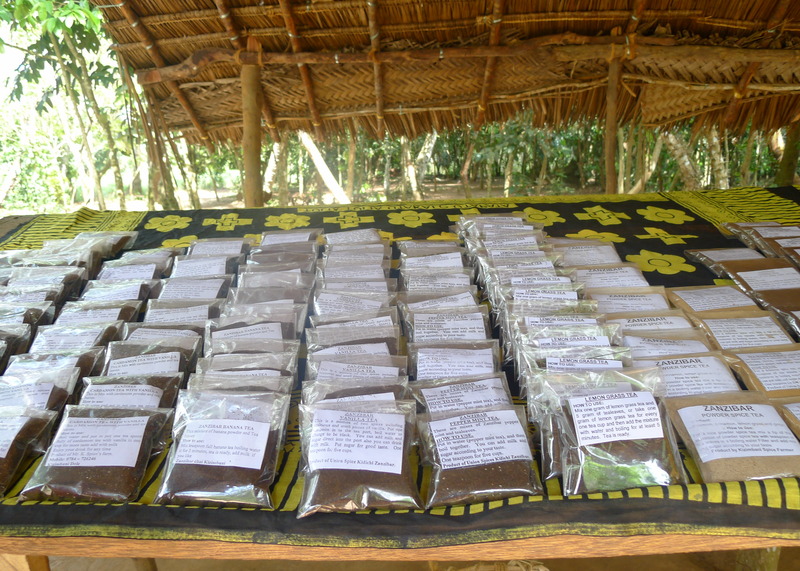 The spice farm is community owned and they all share in the profits (including the dog I saw eating the fallen fruits). 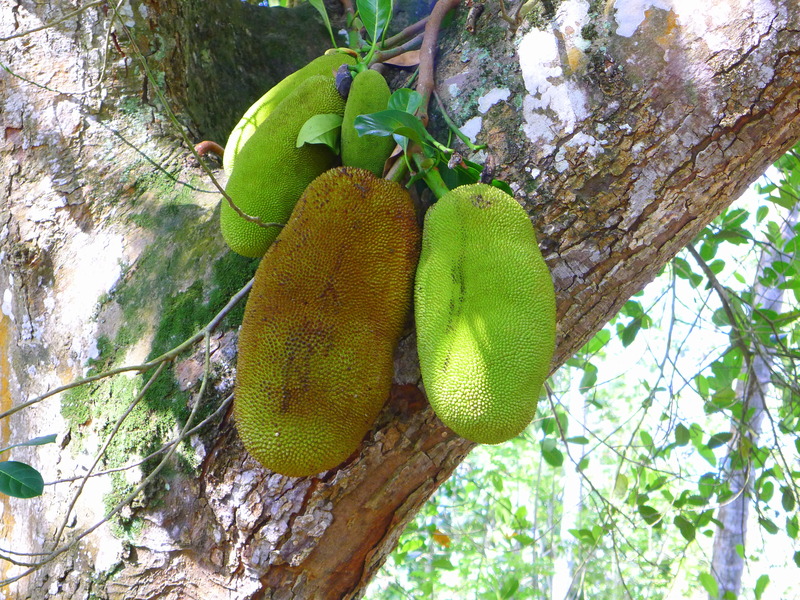 As we visited each plant or tree, an assistant would tear off a leaf or slice into bark for me to smell and guess what spice is derived from it. I sucked at the game. The only thing I was able to guess was the scent of vanilla. Later, “Nutmeg has many uses. You can make it into a tea to help with your nerves if you are like, a singer. But, it’s also good for women as an aphrodisiac. If a man takes ginger and a woman takes nutmeg, it’s like a boom! You don’t know who will win.” He pantomimed an explosion with his hands. I giggled. 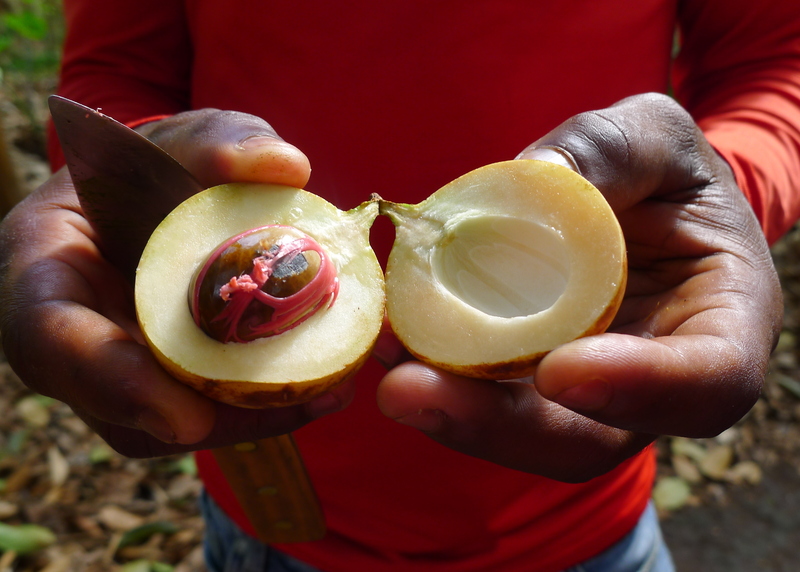 Nutmeg, which my guide informed me has many uses including use as an aphrodisiac for women. 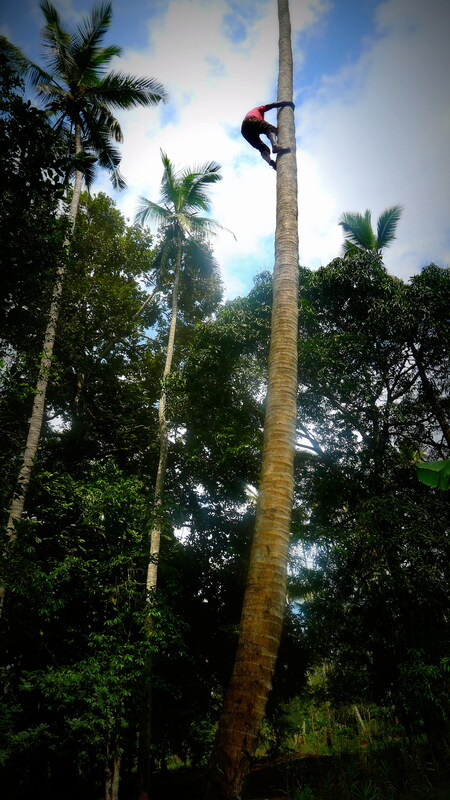 Tree climber – his job is to climb trees to retrieve fruit. Tree climbers’ skin becomes rough due to the nature of their work. Near the end of the tour I tried some of the tropical fruits grown on the island: mangoes, green oranges, orange oranges, jackfruit, papaya and a couple of different types of bananas. The guys serving up the fruit in a open-air hut, were listening to Drake. 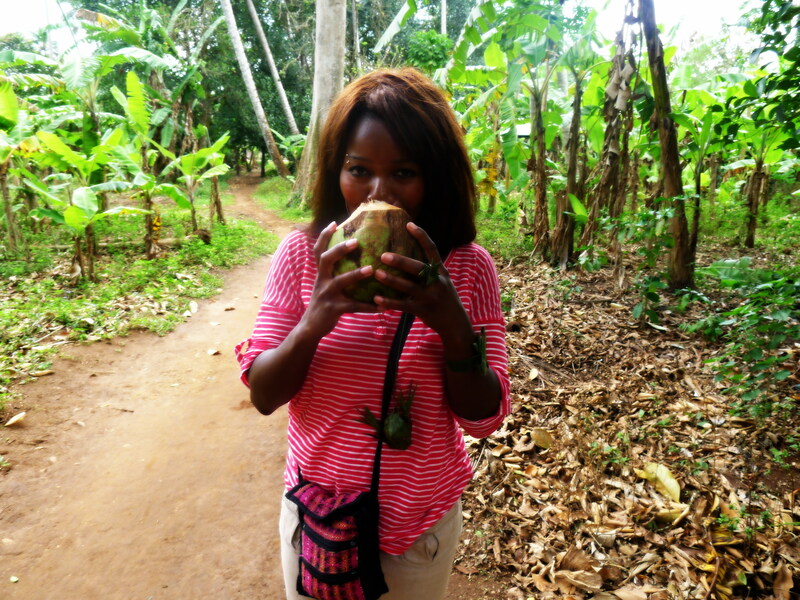 They spoke barely any English but were jamming to “Forever.” The one who cut my fruit flirted with me via my guide. I didn’t need him to translate though. I’d learned the words for “beautiful,” “(not) married,” and “American” quickly. I loved that the men I met in Tanzania were so upfront (but respectful) about their interest. It was refreshing and flattering. With my spice tour guide. I’m wearing handmade souvenir gifts made for me from plants on the farm. My driver waited for me (with my luggage) during the hour and a half I toured the farm. He then drove me into Stone Town where another guide was waiting to take me on a tour of the city. My driver let me know he’d return for me to take me to the airport in a few hours. This kind of personalized service would have cost me so much more in the States. 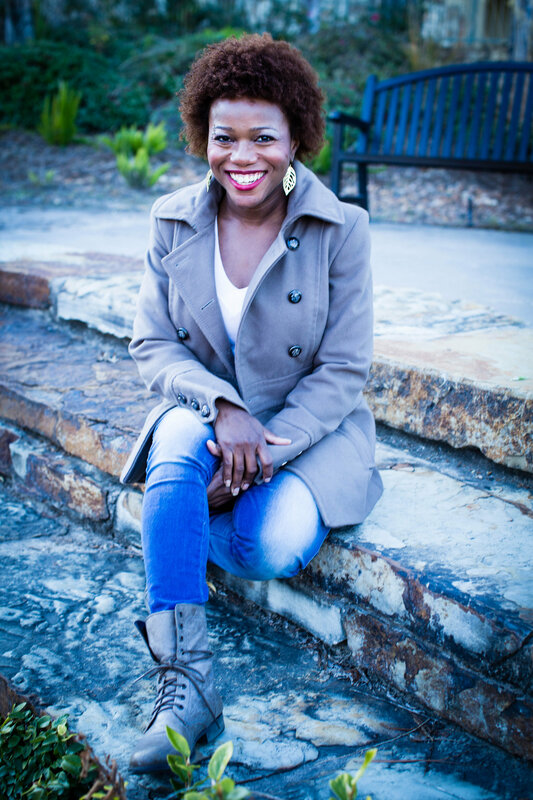 In TZ it was affordable and I felt like I was helping employ people who needed it. This little girl is too cute and she happened to be grasping an impressively designed door. The people of Zanzibar have an interesting ethnic makeup due to colonialism and trade with influences from all over Africa, as well as Britain, India, Oman and Portugal. 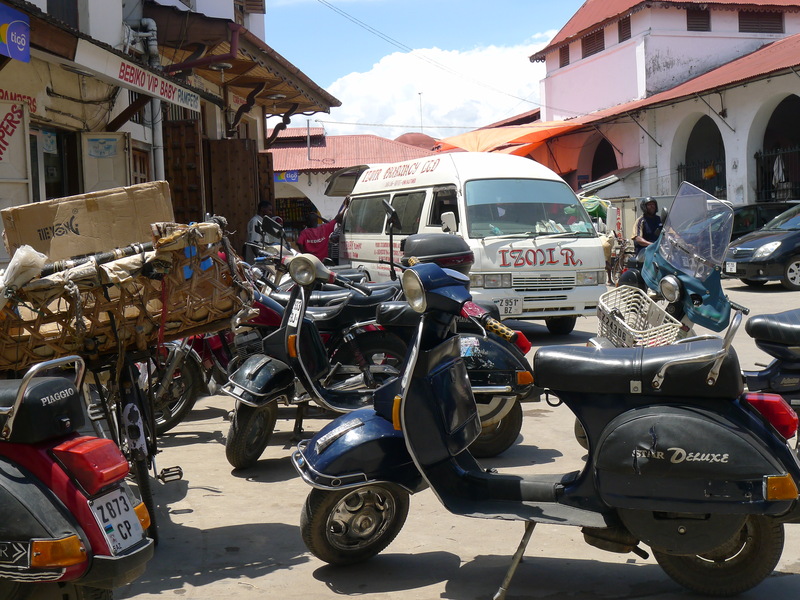 This diversity was especially noticeable in Stone Town, the hub of Zanzibar. Ninety percent of the population is Muslim, 7% Christian and the remaining 3% of other religions include Hindu. Many of the women dressed in traditional Muslim coverings and the looks I got for showing the bit of leg I did in my capris did not escape me. I found myself scandalized when I saw two female tourists wearing booty shorts and tank tops. Put on some clothing, you harlots! You can also see the varied cultural influences in the architecture. 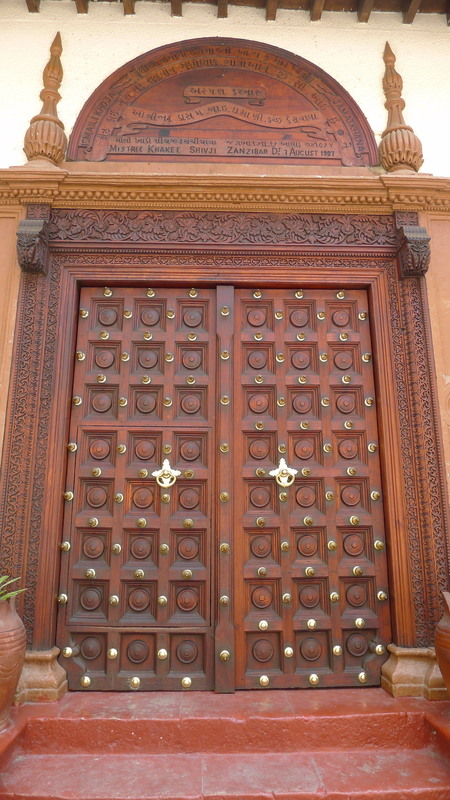 There are the Arab-inspired narrow streets and open air markets; the ornate, heavy wooden doors with rounded tops reminiscent of India; and its own native influence with buildings constructed from crushed limestone and coral, hence the name Stone Town. 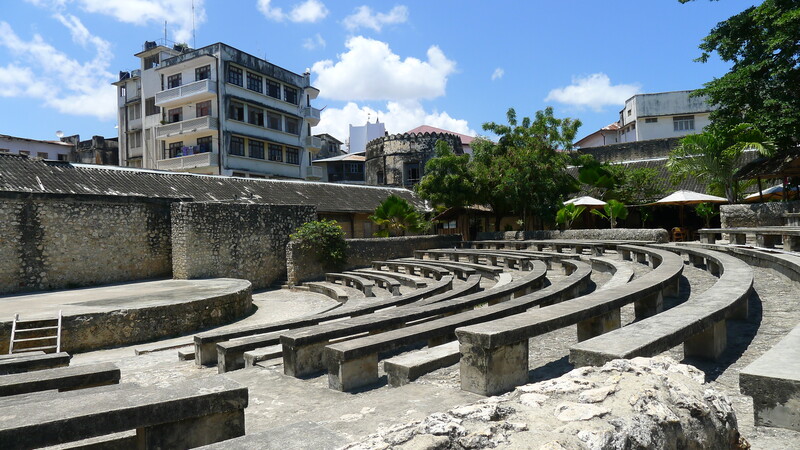 Zanzibar is more of a tourist destination than Moshi and I observed a distinct difference in the treatment of visitors in each place. In Zanzibar, the locals greeted visitors with “jambo,” which I’d learned soon after arriving in Tanzania, is a greeting used for tourists. Having been in Tanzania for three weeks, I was taken aback by the number of “jambos” directed my way. My guide clearly took his job seriously as he rattled off historical facts in rapid succession. I love history, but I found myself becoming mentally fatigued. I can’t keep all of these Kings straight! We visited the site of a former slave market where a Christian church now stands. Left intact is the cellar where slaves were held until auction. The cellar was dark, windowless, tiny and at 5’1” even I probably wouldn’t be able to stand upright without hunching over. The captors chained people up in this dungeon with no access to food, water or even a way to relieve themselves. Outside is a tree that stands as a marker for the old trading post. 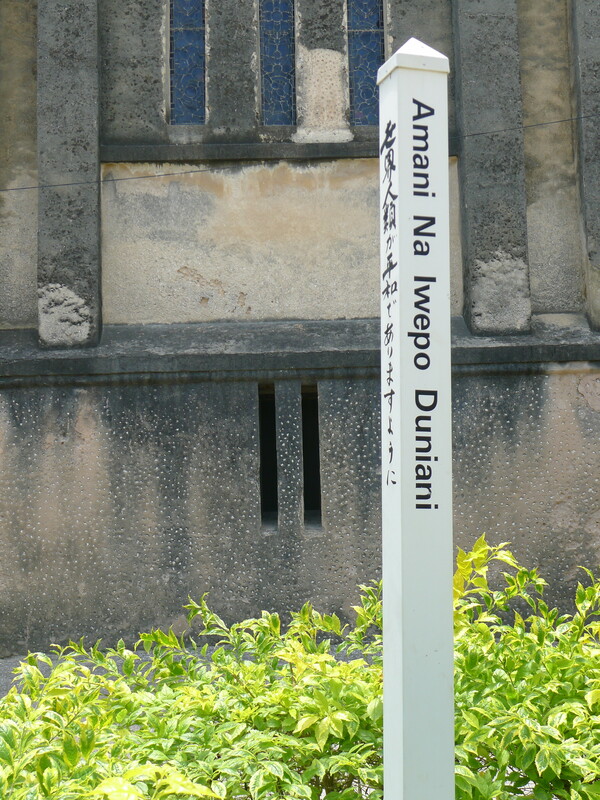 Near it is a monument to peace with messages in four different languages. 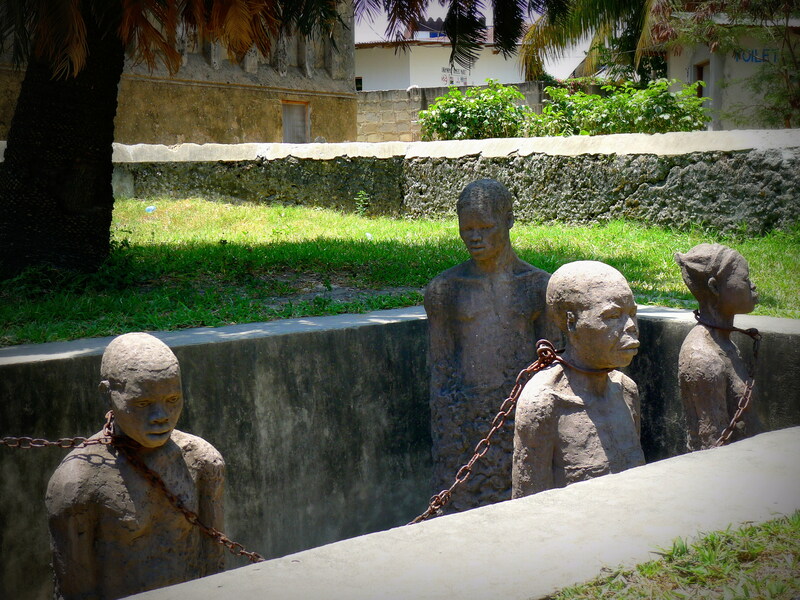 There is also an art installation depicting five African slaves chained together by their necks awaiting sale at auction. The chains are from the originals used on the captives. Taking all of it in, I felt the same sobering, heavy feeling I got when I visited the Anne Frank house in Amsterdam. Sometimes I hate people. The museum was disappointing. Aside from a plaque outside and a handful of newspaper clippings, I’m not sure what made it a museum.I didn’t actually see anything about Freddie Mercury inside. It seemed like any other souvenir shop. 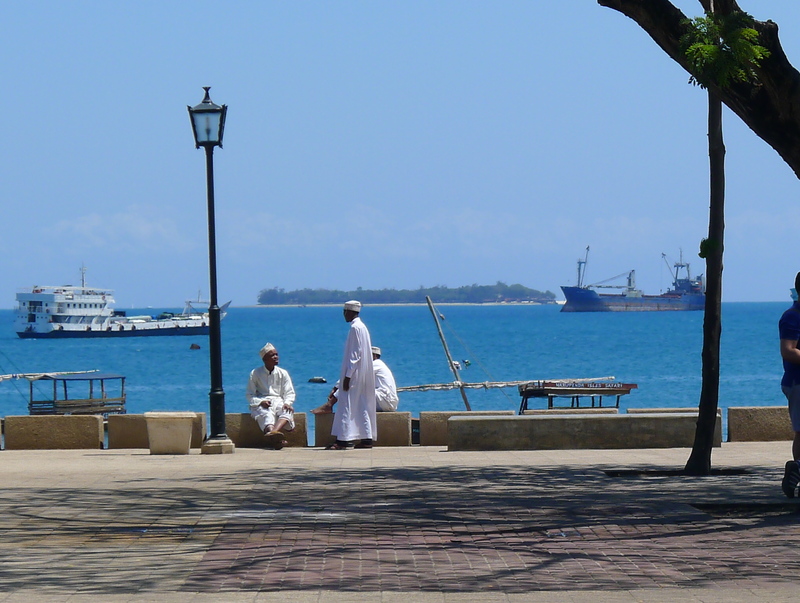 I liked Stone Town, but a few hours touring the city was enough. 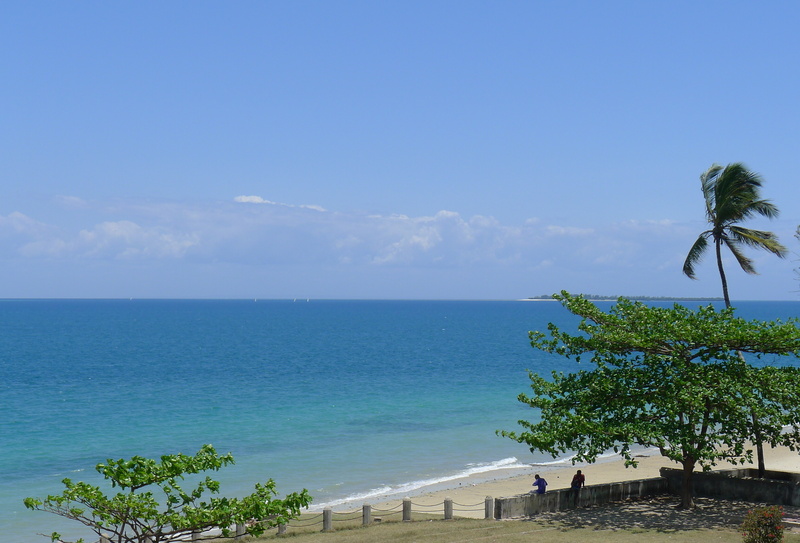 Perhaps at another time I might like to try some of the restaurants and maybe spoil myself and spend the night at one of the expensive rich-folk hotels, but I enjoyed the quiet and ease of Nungwi more. I knew I would also miss the men of Tanzania when I left. What an adventure. Thanks for sharing such a beautiful place and interestingly written. I want to go!!! It sounds wonderful.